This series of six brief explanatory videos provides 'need to know' science information to understand risks posed by methane hydrates. The blogosphere for years has been abuzz, and particularly in recent weeks, with information – and, equally importantly, misinformation – about the near-term risks posed by uncontrollable and potentially catastrophic releases of large Arctic deposits of methane hydrates, ice-like substances holding a powerful greenhouse gas. Highly vocal have been voices cautioning about existing or perhaps imminent methane releases to the atmosphere, resulting in global catastrophe or cataclysm and threatening human civilization. Such concerned voices in recent weeks are the focus of this post, as many appear to be in response to the January 29 post of videographer Peter Sinclair’s monthly video, at this site. That video included interviews with several highly regarded experts pushing back on the doom-and-gloom “methane time bomb” meme. It’s no surprise that some of those recent and ongoing online commentaries mischaracterize the expert perspectives reflected in that January 29 video. One comes to expect that of the online world of commentary and hyperbole. Carolyn Ruppel, PhD, who heads the gas hydrates research project for the United States Geological Survey, USGS, is among those featured in that video, along with other reputable scientists. But given constraints on how much information could be included in that single six-minute video, we provide here six brief educational videos – ranging from one minute to nearly five minutes – drawn from the Ruppel interview remarks not included in that initial video. These six segments provide authoritative background on the “methane time bomb” and why experts may not “lie awake at night” fretting about it. In this video, Ruppel explains the fundamentals of methane hydrates, where they are concentrated, and why. The areas of greatest concern are in the Arctic continental shelf, which during the last glaciation, when sea level was lower, were vast northern permafrost grasslands. 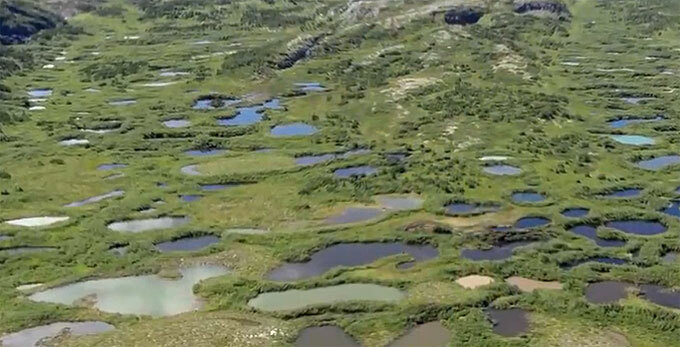 This “Serengeti of the North,” as climate scientist Ben Abbott of Brigham Young University has called it, helped lay down massive layers of vegetation and living remains, now frozen in permafrost. And in that frozen permafrost are isolated deposits of methane hydrate, a potent greenhouse gas. As the glaciers retreated as a result of changes in Earth’s orbit, oceans rose and flooded large areas of permafrost coastal plain, forming an extended Arctic Ocean shelf. In that shelf area, relatively warm ocean waters may cause those hydrates to break down. Ruppel explains, however, that because hydrates can concentrate only in certain types of soils, they are not as widespread as some people believe, and huge methane releases from hydrates have not been confirmed in these areas. Editor’s note: This post and the six videos were updated on 2/9/19 to correct the date the interviews were conducted.